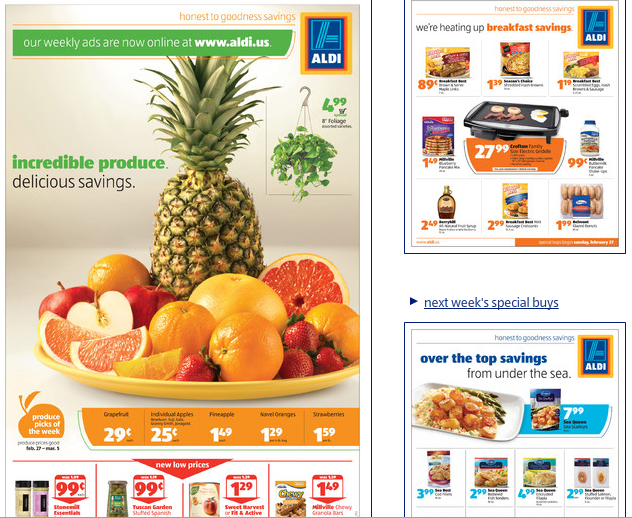 I am very excited to see that Aldi's weekly ad is finally online. Here in South Florida we only get the special buy ad in the store, which means that it has been impossible to find the prices on produce until now. I love the fact that you can find your specific local ad, and I think it is very interesting to see how the prices change dramatically from area to area. Did you find any great price variations in your ad. Make sure to check out the grocery price comparison list, to see how your Aldi store holds up against the competitors. That is interesting. I'm glad it's online, too! Makes it much easier. I'm in Atlanta, and our strawberries are $0.99, but even Publix has them for $1.67. Ours come from Florida right now, and it's the peak of their season. Betsy, I actually bought the strawberries at Publix this week, because I had coupons to use. However, I must say that the strawberries I got at Aldi a few weeks ago were much better tasting. I hope they will keep the price down on strawberries for a while, as I am a huge strawberry fan too. In Fayetteville, NC, strawberries were also $0.99, whole pineapples $0.99, blueberries $1.49, mangos $0.99. We do not have a Publix in our area, and I just made a nice fruit salad with all the fresh fruit. YUM! That fruit salad sounds splendid!